Our latest website design Kilkenny project is for Redwing Engineering a sister company of Kavanagh Engineering in Thomastown, Co. Kilkenny, who were valued existing clients. We had already built three websites for Kavanagh Engineering: their main group site, shoppingtrolleysystems.ie, and photovoltaicsystems.ie. When the time came for a re-build of an existing Redwing Engineering site, they had just one partner in mind. That was us. We were both proud and pleased that they came to us again. We set out to do just as good a job on this site as the others. First up was a thorough audit of the existing site. We also got up-to-date information on the company and how it had evolved since that site was built. We removed obsolete information and crafted new content for Redwing’s current range of products. Our senior copywriter took source material from company and supplier brochures, and transformed it into SEO-friendly text for online use. We also sourced and optimised a large number of product images. Our customary online market research was another key component of the planning process. We advised on likely traffic levels and conversion rates, to give the client as accurate a prediction as possible on what to expect from the completed site. 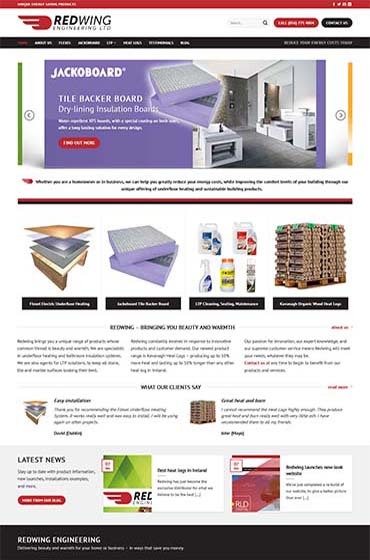 The client wanted a site that was somewhat similar in appearance to the existing one, but with a ‘warmer’ feel. Our senior designer achieved this through measures such as careful colour scheme selection, and a selection of home page sliders that are both inviting and informative. Other ‘user-friendly’ measures included a clear funnel structure on the home page, and clear calls to action at key locations. We attractively laid out internal pages with sub-headings, image galleries, and bullet points, to break up what was rather technical text in some places. The result was a site that was easy to navigate and that was soon generating leads for our clients. They were delighted with what we produced, and look forward to continuing to work with us into the future. We look forward to working with them too!